“Star Trek Into Darkness” opens Thursday at Point, Eastgate, Star Cinema and Sundance. PG-13, 2:08, 2 and a half star out of four. I hate to be that guy. It’s no fun to be the humorless fanboy who can’t just enjoy the latest installment in a franchise, but has to hold it up against everything that has gone before. But, as a lifelong “Star Trek” fan, of the sort that used to hold his little audiocassette recorder up to the console TV as a kid to record “Amok Time” and “The Trouble With Tribbles,” it’s hard not to. So, while “Star Trek Into Darkness” is a fun ride that captures a lot of what made the original series so enjoyable, I couldn’t help feeling let down. Not because J.J. Abrams and his writers have ignored what “Star Trek” fans want. It’s that they’ve pandered to it to such a degree that it feels less like fan appreciation and more like base-covering pragmatism. Add to that the usual summer-movie pandering to audiences who want lots of big explosions and people dangling from ledges (seriously, that engine room has to violate every 23rd-century OSHA requirement in the book), and you’ve got a film that’s surprisingly timid. Disappointing, because Abrams’ 2009 “Star Trek” reboot was such a triumph. I was extremely skeptical going in of the idea of reviving Kirk, Spock and company with a new young cast, but Abrams and his writers captured the human element that made the series work, the banter between Kirk, Spock and McCoy, the sense of optimism and humanism that pervaded Gene Roddenberry’s visit. Add in a rather elegant way of using time travel — a recurring theme in the series — to justify the reboot, and it felt like “Star Trek” was well and truly rejuvenated, ready to boldly go forward. And then we have “Into Darkness.” An ex-Starfleet officer named John Harrison (Benedict Cumberbatch) has gone rogue, engineering a bombing in London and an attack on Starfleet headquarters. He hides out in a deserted part of the Klingon homeworld, and Admiral Marcus (Peter Weller) sends a revenge-seeking Kirk (Chris Pine) and his crew on a mission to assassinate him. The crew, especially the moralistic Spock (Zachary Quinto), has deep misgivings about the mission, but the hot-blooded Kirk wants atonement for a personal loss. The film is obviously aiming at a kind of post-9/11 allegory, not because it has anything to say about the War on Terror, but because “Star Trek” always does allegory, right? Again, it feels like pandering to a fan base that Abrams doesn’t quite get. Where the plot goes from there shouldn’t be spoiled (although I want to write about “Into Darkness” again in a week or two), except to say that the plot basically revisits one of the classic episodes of the series. Winking at old fans is fine — I’m a sucker for a Gorn reference or a Tribble cameo as much as the next Trekkie — but “Into Darkness” basically becomes a retelling of that story, down to the point that screenwriters Roberto Orci, Alex Kurtzman, and “Lost” co-creator Damon Lindelof rehash familiar scenes and lines of dialogue almost verbatim. There’s nothing new here, and what’s old isn’t done nearly as well as it was the first time around. And the character work is great — I felt a huge wave of satisfaction, 40 minutes in, when the entire crew finally settled for the first time at their usual posts on the Enterprise bridge. Pine makes a fine, swaggering Captain Kirk, although at some point he’s got to lose that reckless-hothead image and start acting like a Captain. And Quinto makes an ideal foil, able to both play straight man to Kirk’s quips and top them, drily. They act more as friends here than in the first movie, and that’s an appropriate and necessary step forward. After finding the right emotional ending, though, you can almost feel Abrams panic, and “Into Darkness” adds on yet another climax, with more big explosions and more chase-fight-dangle. I can’t imagine the next “Star Wars,” which is near and dear to Abrams’ heart, will be like this. He seems to be saving himself, cautiously maintaining the “Trek” franchise until he can pass it off to a director with a little more skin in the game. Like I said, “Into Darkness” isn’t bad, but it’s a missed opportunity to be more than the summer blockbuster of the week, spiced with winking asides at the “Star Trek” faithful. At the end of the film, we get the promise that the Enterprise will finally, finally embark on its five-year mission. I hope they find something new out there. A Gorn reference in this review about a Gorn reference in the movie! I did the whole audio cassette recording thing too. I think Rotten Tomatoes must have it right when it matched you up with me as a “My Critics”. I’m not quite as disappointed with this outing as you are but you make some great points. I will have to watch it a couple more times, but it is still going to be one of the 4 or 5 best Star Trek movies I have seen, I believe. Thank you Matt! I appreciate that. I’m glad you liked Into Darkness and wonder if my own opinion on it will change over time. Thank you for writing! It won’t… This is a terrible movie that is riddled with even more plot holes than the ’09 movie (who knew that was possible? ), and is a blatant ripoff of one of the great sci-fi movies ever made. Call this one “The Wrath of Con,” because that’s what it is. Nothing original, or even remotely interesting, to see here. Abrams’ disdain for the original Trek (and, apparently the series that followed) is well-known (he even made a point of mentioning it to Jon Stewart the other night) and his attempts to make it more “cool” is to just distract us with shiny set pieces, more brawn than brains, and (of course) plenty of explosions. Chris Pine’s “Kirk” certainly doesn’t resemble the Kirk I remember, but the movie pays lip service to insipid cliches like Kirk supposedly banging any female in his reach. Apparently, lazy laughs like that are easier for three stooges who wrote this mess than coming up with actual character motivations. Now we have magic blood that apparently cures death, and transporter technology so powerful that there’s really no need for starships anymore. Where does this confused franchise go from here? Down the tubes, if there’s any justice, but I’m sure the masses will lap this pablum up anyhow. I’ll skip this movie and enjoy the nice weather this weekend instead. When I feel like watching some good Trek, however, I’ll pop in The Wrath of Khan, or maybe catch some of the better episodes of TOS, TNG or (especially) DS9 on Netflix. Thanks for writing Shaun! Yeah, that was one thing that baffled me about the new “transwarp transporter” — if you can beam across the galaxy in the blink of an eye, what’s the point of a five-year mission? It seems like they solved a short-term screenwriting obstacle by creating a major long-term narrative problem. I agree that oddly enough Abrams stumbled a bit by trying to be too reverential to the original series, a pitfall he avoided in his 2009 debut with the franchise. Still it is a fun summer blockbuster and the IMAX version I saw is spectacular. Agreed on IMAX 3D — that “torpedo Kirk” scene was an eye-popper. Thanks for writing Lori! I agree with just about everything you said Mr. Thomas, and quite frankly I’m surprised to see so many Star Trek fans enjoyed this movie and seem ok with the direction the third act took. One of my biggest problems is that characters in this movie don’t just act different from the series but have differences that don’t make sense, and unlike the first movie which seemed to explain it using the altered reality due to the attack on the Kelvin, this movie just basically had Abrams say, “I’ll cast whoever the hell I want, to hell with the Trekkers!” So because of that we’re left with a John Harrison and Carol Marcus who both have British accents, and knowing who their original characters are in the original Star Trek universe, you can’t help but question how that one event could have affected their accents so drastically. The writing is lazy, the casting is not as great as many people have praised (Karl Urban channels the original Dr. McCoy better than any other of the actors channel their respective original series counterparts), and there is not nearly enough chemistry and character development to convince me that Kirk and Spock really cared about each other, or that Uhura and Spock could have ever been a relationship. They just assume the audience will accept these things because they’re told to, instead of supporting it with the appropriate dialogue and back-story to make it believable. This is why the third act fails so miserably, because unlike the unpredictability and perfect arc of events and dialogue that made Wrath of Khan so effective, this movie took the easy way out, and left me face-palming when that recycled scene took place. I still think this cast can do Star Trek (hopefully with some changes), and thank goodness Abrams and his team will be gone after this, but man did this movie leave a bad taste in my mouth. It had potential to really stand on its own and be great, but it chose to pander instead of pay homage, and I find it a little insulting to our intelligence that they believed we wouldn’t notice the difference. I agree with all that James, especially your last sentence. Thanks for writing! Hey Rob, you have some hotheaded commenters. This movie was an amazing work, truly epic and beautiful. Cumberbatch is an incredible addition to the modern mythology. Nostalgia is a great and terrible thing, keeping good memories and cleaning up the jagged edges. The reality of the nearly unwatchable campiness of the original series and ensuing under budgeted and painfully written movies, is lost on the many Trekkies and Trekkers. As a Star Wars fan, I know all to well the contortions one can put themselves in to explain away flaws in the source or the urge to try to “blame the new guy.” In my case I was forced into reality by the prequels because the “new guy” was the “old guy” and creator. Now, I see the essence of greatness in the stories of Star Trek, but it took someone outside of the fog of nostalgia to make it visible and viable to everyone else. I believe it was better achieved by JJ the first time around, but this was an excellent addition to that astounding accomplishment. I agree that the parts that paid homage were sometimes closer to a checklist than I would like, but it was always surrounded by something jaw dropping or witty; moving or shocking. Just remember that this was the SECOND Star Trek of the new series, and that carried a lot of expectations. With that in mind they flipped some things elegantly, and some things literally, but did a good job honoring that. This may not be the best Star Trek, but it is the second best at least, and that means they’re doing something right. I couldn’t agree more with everything you said. The problem with some of the commenters here (and on other sites) is that many are lifelong Star Trek fans, so they have preexisting expectations and opinions of what a Star Trek film should be, so the only thing some of them see/remember in a film like “Into Darkness” are the flaws, and are thus often unable to focus on that which the film does well. Conversely, some adore the series so much that they only remember the positives of the series, and overlook or repress that which always frustrated them. Essentially, the nostalgia effect that you mentioned takes over. Does this mean that their opinions are less valid? Absolutely not. It just means that those opinions come from a very different place than those of the average viewer, who has less understanding of the original Star Trek universe, and fewer expectations of what it should be. Many of these fans, for some reason, expected/hoped this new era of Star Trek films would fall directly in line with the original Star Trek – to tell stories in the same ways, to develop characters in a way such that they are near-identical to their 1960’s counterparts, to maintain the same slow but fascinating pace that made Star Trek iconic, etc. – and were deeply disappointed when they were not given exactly that. Here is the issue with that: JJ Abrams and Paramount absolutely CANNOT afford to make a movie exclusively for Star Trek fans. They need to create films which appeal to a much larger audience, otherwise they will fail commercially, and probably critically as well, because that which made Star Trek such a pleasure for Trekkies is often the same thing that kept so very many television/film viewers from taking interest in it in the first place. In the case of “Into Darkness, “the average viewer does not have a preexisting knowledge of Kirk, or Spock, or Scotty, or Uhura, so they have no hangups with less-than-identical portrayals of these characters. The average viewer has not seen “The Wrath of Khan,” so they are not bothered by a rehash of previously told storylines. The average viewer knows very, very little about the Star Trek universe at all, so they will not be thrown by inconsistencies between the source material and this film. It is perfectly fine for Trekkies to be upset with this film because it does not fall in line with what made them fall in love with Star Trek in the first place, but the fact that it fails to meet that group’s biased expectations does not make “Into Darkness” a fundamentally bad film, just one that does not appeal to their sensibilities. On a related not, non-fans of Star Trek who enjoy this movie are not poor judges of good film, as some of you here seem to believe. 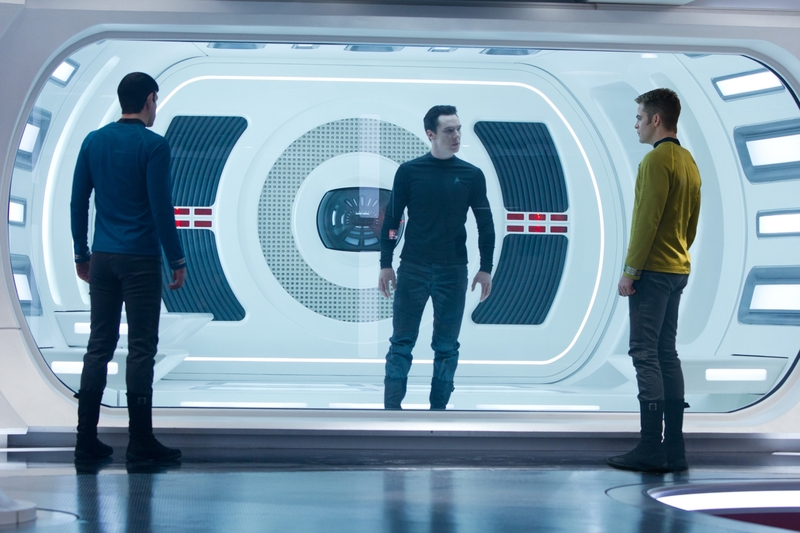 Personally, I absolutely loved “Into Darkness,” far more than any film I’ve seen in months, and it is most certainly my second favorite Star Trek film thus far. As a late-comer to the Star Trek universe (I was only born in 1988), but having been introduced by my dad, I was familiar enough with the references to Star Trek of old (Khan, Dr. Carol Marcus, Dr. McCoy’s personality) to understand why those inclusions were significant, while at the same time limited enough in my knowledge of past Star Trek events (I’ve never seen “The Wrath of Khan,” for example) to be able to enjoy the film without being bothered by the differences. It was a fun movie, which is all anyone should have expected it to be, and I will happily pay to see it again. Remember without the original Star Trek which is what us “Lifelong Fans” enjoy there would be no Into Darkness. New timeline or otherwise.